I love making custom work! Here are some examples of custom pieces I've done in the past. People commission all sorts of things - family portraits, pets, drawings of their dreams, and pictures of them doing their favorite things. Custom prices vary depending on the form and detail of the drawing. The work takes about 6-8 weeks to complete. Email me and we can turn your idea into a plate, mug, or serving dish! 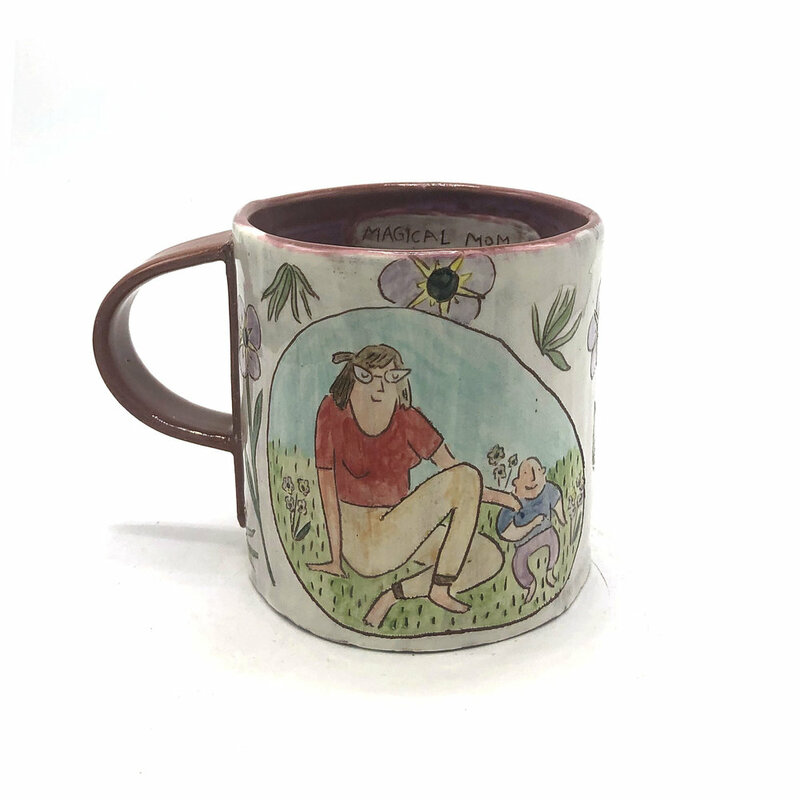 Becky wanted a mug showing her and her boyfriend playing disc golf, and I was happy to oblige! This couple spends every Sunday doing their “routini” - ordering chinese food and watching tv on the couch. Christian wanted to make something special for his wife, whose relationship with their son inspires him. This client asked for a serving bowl with her parents rowing on the river by Boathouse Row in Philly. A sweet plate memorializing a special friendship that is filled with long walks on windy beaches. A client had a dream that she and her best friend were floating in innertubes down a river, not looking where they were going. They were laughing and not worried about not being able to see their destination. She told me that this dream occurred when she was going through some stressful life transitions, so it gave her some relief to know that everything would be ok. 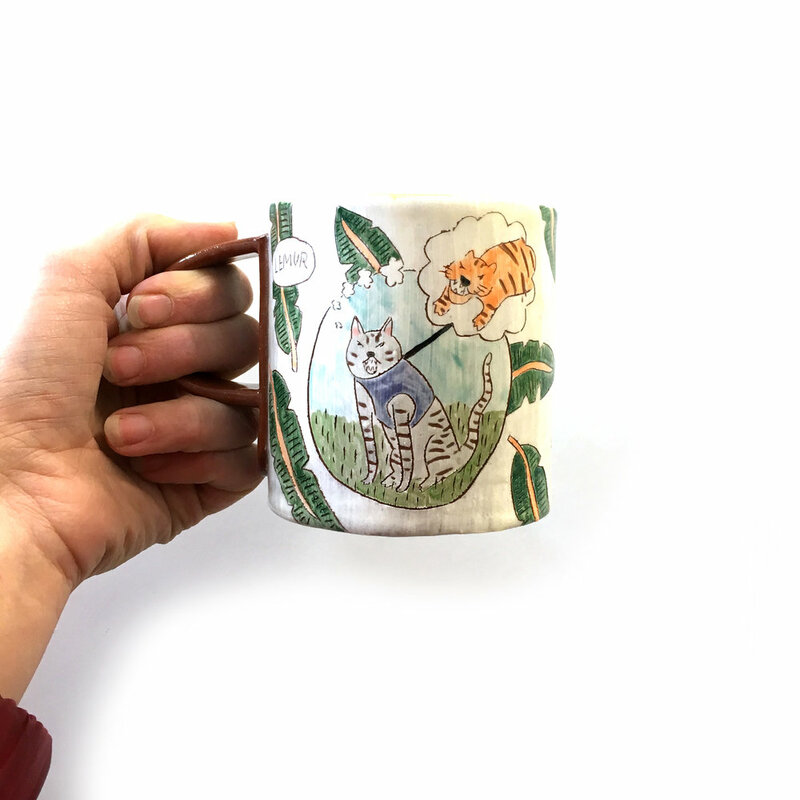 I worked with a client to portray his girlfriend's cat, Lemur, on a mug. He sent me images of Lemur in front of tiger posters, so I decided to make the thesis of the mug that Lemur believes he is a big cat. For this commission, the client wanted to immortalize her pup, Rupert. His favorite snack is peanut butter, so we incorporated that into the pattern, along with flowers to tie into the vignette. Kate and Mike bought their first home together! Here it is on a deep serving bowl with a scalloped rim. Michelle's son loves to pick flowers. 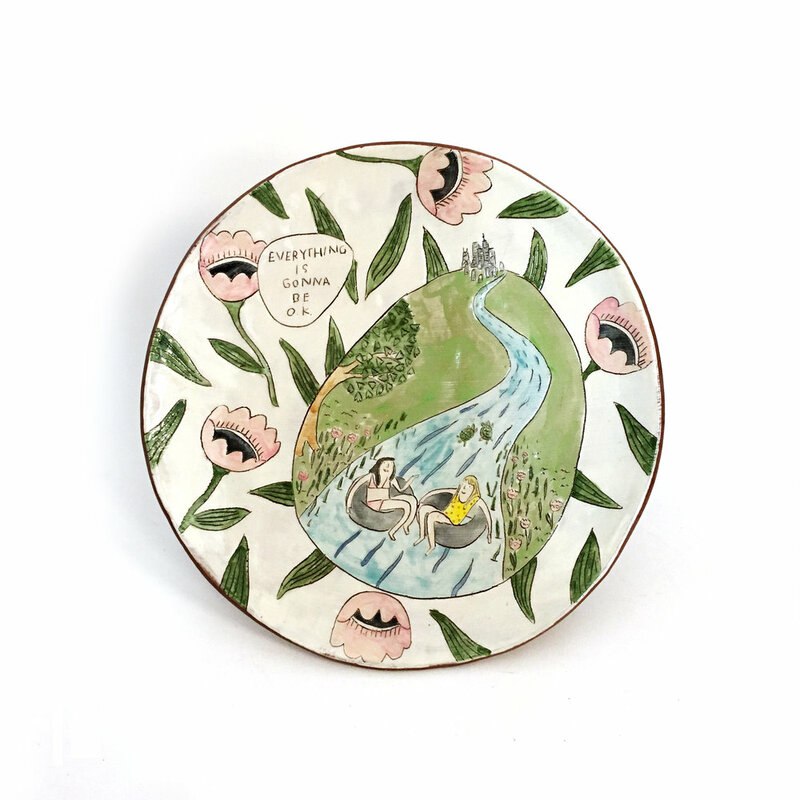 Michelle and I worked on a set of 4 plates that would serve as a portrait of her sweet family. I made a plate each of her, her son, and her dog, and the final plate was the three of them together, making pumpkin muffins, one of their favorite family activities. Tif and Trevor love their potted plants, so I incorporated some seeds and planters on this deep serving bowl. I worked with a client to create this special mug set with his girlfriend, her dog, and her home with a red door. Patches the dog in the background, Patches the mug in the foreground. Patches loves carrots and bones, so they comprise the pattern around the mug.